SEE ALSO: FM, SW, TV DX. ** - Was broadcasting an Eastern Arizona basketball game (as evident in clip). Called and confirmed with studio guy what he was saying in the clip. Prior to recording, several mentions of Yuma were heard. 610 Lancaster 10-16-10 4.9/4 DIR Fox Sports Radio "Fox Sports 610"
*- Confirmed by both brief ID and direction of radio, plus nulling of KFAQ. 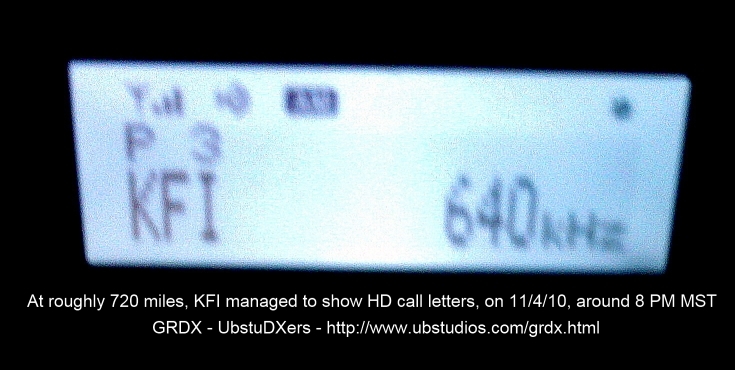 ** - KIXW was likely stuck on day power during reception. 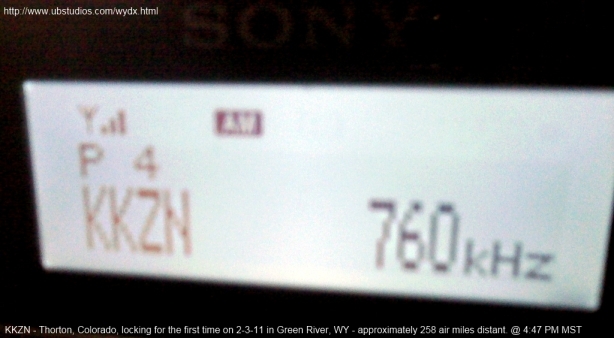 980 Glenwood Springs 2-19-11 1/225w Not DIR News/Talk, Ided! 1190 Boulder (reconfirmed in 2010) 6.8/110 Not DIR College Univ. of Co.
Freq City of TX Power Antenna Type Format/Additional Info. 730 Boise (as early as 2002) .5/.084 Not DIR News/Talk (was Jazz). ***-WJR was confirmed due to programming. It was playing Dr. Laura at 9PM MST and according to their schedule, was the only affiliate of hers playing the show at that time. This is the only possibile station on 760 with Dr. Laura at that time. 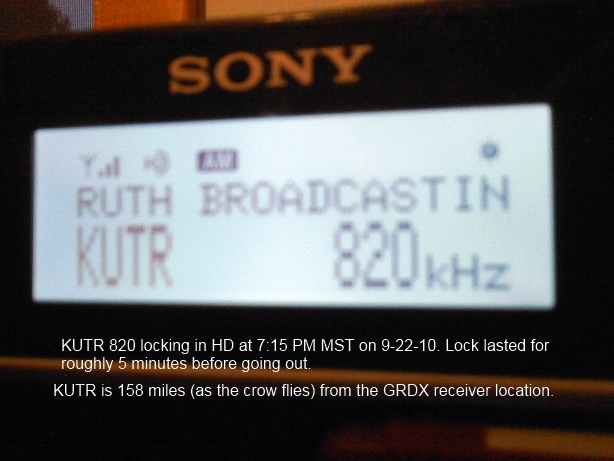 Heard underneith KKZN from Thorton, CO and KFMB from San Diego. Dr. Laura's trademark voice and opening was what I heard. 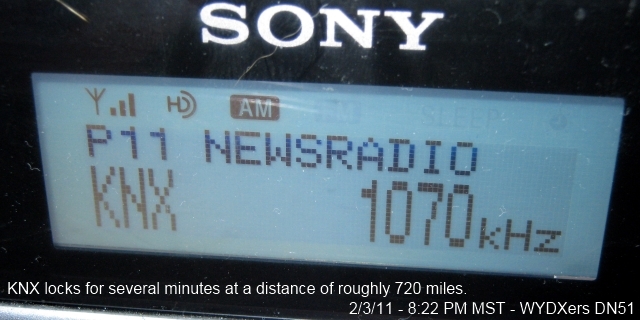 *KCMO is one of the only affiliates on 710 that airs "Art Bell - Somewhere in Time". This is how I confirmed the station. 680 East Helena 11-19-10 (QSL) 5/0(5) DIR On day pwr. 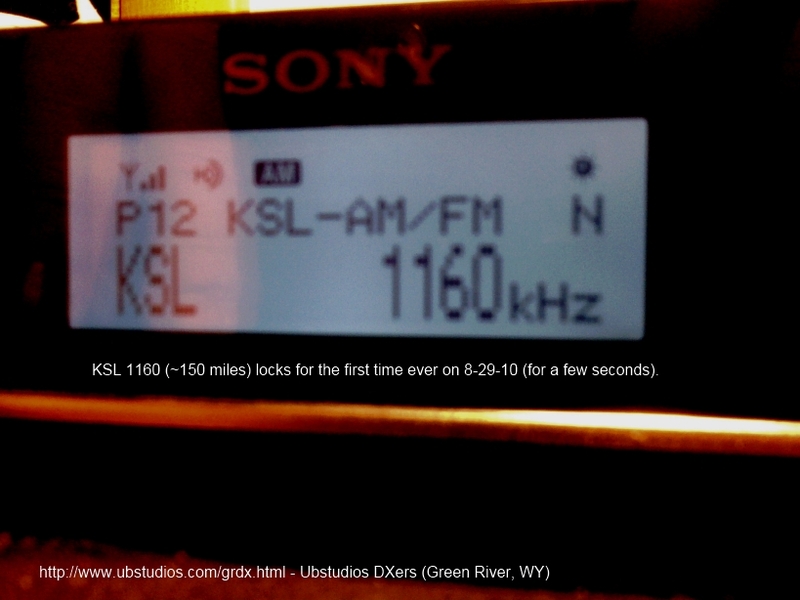 "New KGR"
*Station was received from Rawlins, WY to Rock Springs (15 miles east of Green River), from about 3 PM to nearly 4 PM. The sun set and it disappeared in the mess. Freq City of TX Power Antenna Type Format/Addn Info. *KRZI was heard on high power, due to the sun being up in CDT, but not in MDT at time of reception. Mentions of Waco were heard. 710 Seattle 1-23-11 50/50 DIR "ESPN Radio Seattle"
1680 Seattle 11-19-10 10/1 Not DIR One of 2 Spanish stns on 1680. 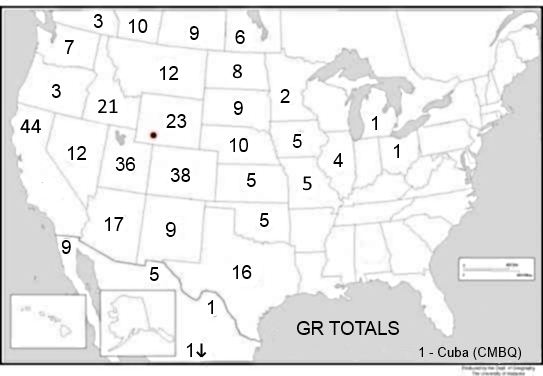 * - First station of 2006 from any WY or UT DX location. CJRB 1220 Boissevain 6-14-05 10/10 DIR Classical (Variety) ID confirmed! 1190 Weyburn 6-25-08 10/5 DIR Country "IDed"
** - Note, the recording of CKBF2 is roughly 5 minutes long and also about 5.4 mb in size. The recording shows the directional signal fading toward the end. 530 Havana 10-24-10 50/50 Not DIR Music (2,011 miles) Thx to WTFDA! 860 Tiujana 11-30-10 10/7.5 DIR Under CKBF2, banda type mex. Only pos. *- Station listed as operating under day power only by FCC, but clearly is operating at night, with an unknown amount of power, most likely 10kw. Frequent IDs, clearly saying Equis (X) eh (E) Day (D). 1000 Ciudad Juarez 8-1-04 1/.25 Not DIR "La Rancherita"
Grundig S350 - Most used radio for GRDX. Sony XDR-F1HD - HD Tuner with extreme sensitivity and selectivity. Primarily used for FM DXing as it is not portable like the Grundig. Quite possibly the best radio ever. Grundig G8 Traveller II - A nice portable with great reception. Post 2014 receptions were likely made on this unit. Grundig FR200 - Radio with AM/FM/SW and wind up power. No longer used.